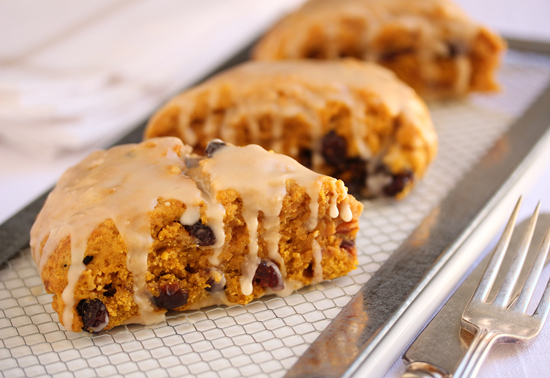 I only have one other pumpkin recipe on my blog, Cinnamon-Sugared Pumpkin Donut Holes, so I thought I would remedy that by making these Pumpkin Cranberry Scones. And before Halloween. Yea! Clap your hands. 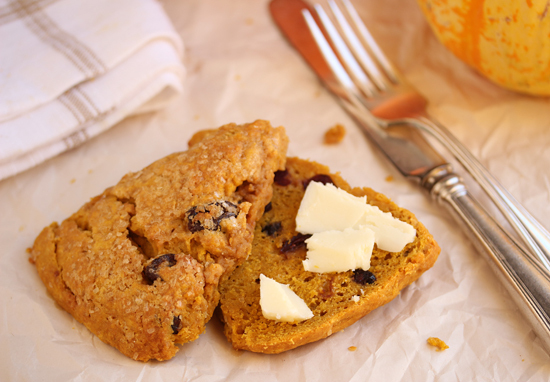 The original Scottish scone was round and flat, about the size of a medium size plate. It was made with unleavened oats and baked on a griddle, then cut into pie shaped wedges. The large round cake was called a bannock and the smaller cuts were called scones. The Oxford English Dictionary first mentions the word scone in 1513. In the U.K. it is pronounced ‘scon’ and in the U.S. and Ireland pronounced ‘scoan.’ I have always used the ‘cone’ pronunciation. How about you? Cone or con. 1. Preheat oven to 400 degrees F. Stack two baking sheets together and line top sheet with parchment paper. 2. In a large bowl, whisk together flour, brown sugar, baking powder, pumpkin pie spice and salt. 3. Cut butter slices into flour mixture with a pastry cutter or two knives until it looks like coarse crumbs. Mix in dried cranberries. 4. In a medium bowl, whisk together pumpkin puree, cream and vanilla. Add to flour mixture and stir until incorporated. Flour hands and form dough into a ball in bowl. 5. Dust parchment on baking sheet with flour and place dough ball on it. With flour dusted hands form dough into 7 to 8-inch circle about 1-inch thick. 6. Using a bench scraper or large knife, whose edge is lightly greased and floured, cut dough circle in half all the way to bottom, then each half into four pie pieces. You may need to reflour cutting edge. Do not move or separate pieces. 7. If you are using raw sugar, now brush top of dough with cream and sprinkle with sugar. 8. Bake in 400 F oven on parchment-lined double pans for 25 – 30 minutes. They are done when pick comes out clean. 9. If you are going to glaze your scones, do not top with cream and raw sugar. 10. When scones are finished baking, transfer parchment with scones to a cooling rack until warm or room temperature. 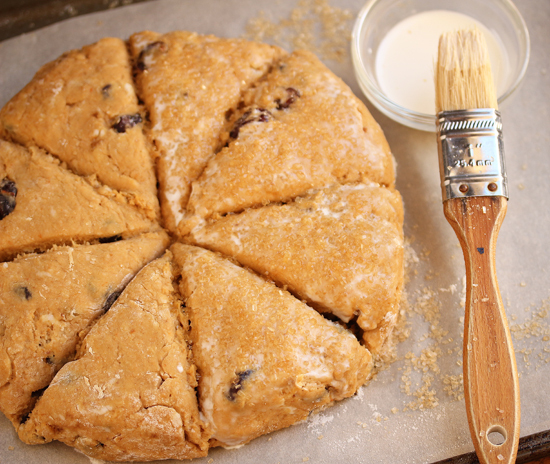 Use a small knife to help separate scones on scored cuts. Serve warm with cold butter. 11. If you are using glaze, place separated room temperature scones on rack and drizzle with glaze. Serve. 1. In saucepan, melt butter over low heat. Whisk in vanilla and maple syrup. 2. Add powdered sugar and whisk to combine. Mixture will be thick. 3. Add warm water by tablespoons and whisk to glaze consistency. If powdered sugar has made small solid lumps, put glaze through a fine mesh sieve into a bowl. OMG! Scones are the thing I miss the most! And these, you tease? Gotta go. Tears are getting on my keyboard. Oh my, I have to wait until November rolls around to try these gorgeous treats! Trying to keep unprocessed this month, but next month, these babies are mine. I love scones (that’s scons to me.) These look wonderful. I love the rich color. 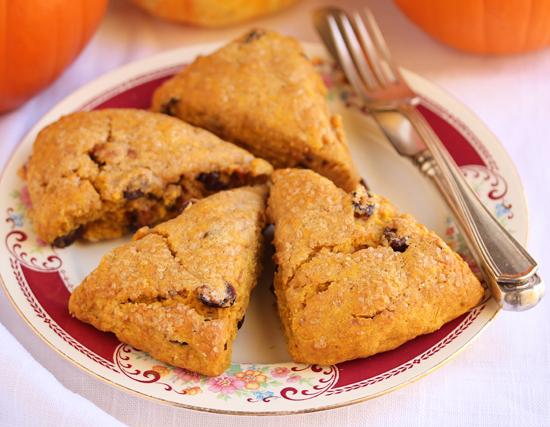 I have never had a Pumpkin scone. And with maple icing, well I am totally intrigued. I am going to make these. Mmmm…wishing I had one of your scones with my morning coffee today. I’m hoping to find fresh cranberries to use in this recipe–would you suggest chopping and still using 3/4 cup? Or another method? Thanks!